Remember back when we used to eat those little individual pot pies? Man I loved those. 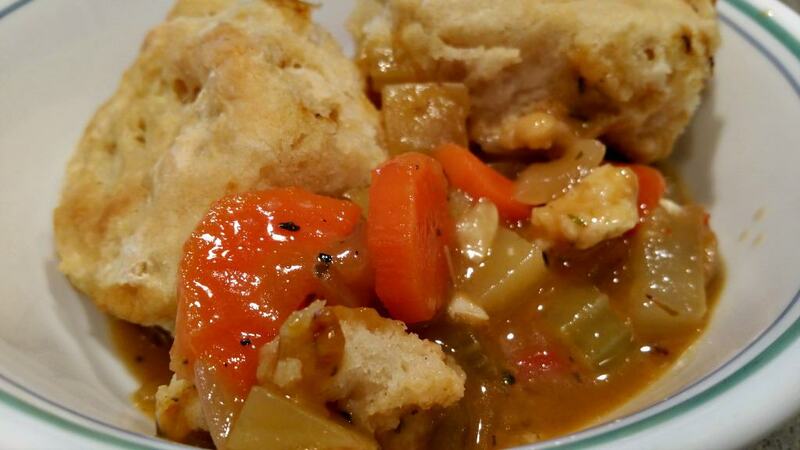 Especially the Marie Callender’s Chicken Pot Pie. That flaky crust? Wow. But then I realized what was in those tasty little tins. Oh yeah, each pie was technically TWO servings (like that stopped us from ever eating the whole thing, right?) So without knowing it we were really gobbling down 16 grams of Saturated Fat and almost 1500mg of Salt. Too bad they don’t sell Vegan Pot Pies, without all the meat, fat, cholesterol, and sodium. Or better yet, why not just make our own? This recipe could easily me made on refrigerator clean out day. I mean really, any vegetable you can think of can go into this. I decided on a mixture of onion, celery, carrots, potato, mushroom, and red bell pepper. I would have added corn and peas but the wife hates corn and peas. I know, right? I have fought THAT battle too many times………. onward. For spices I used Oregano, Thyme, Sage, and a little Rosemary with a little bit of salt and pepper to taste. The family thought it was pretty yummy, but feel free to experiment with your seasonings. The broth is the critical point. Ooooh that thick, rich gravy! Yum. I used 1 cup of Veggie Broth in with the veggies, and then whisked 1/4 cup of flour into a 2nd cup of veggie broth and stirred that in. Then added 1/4 cup of unsweetened Almond Milk to get that rich, creamy consistency. 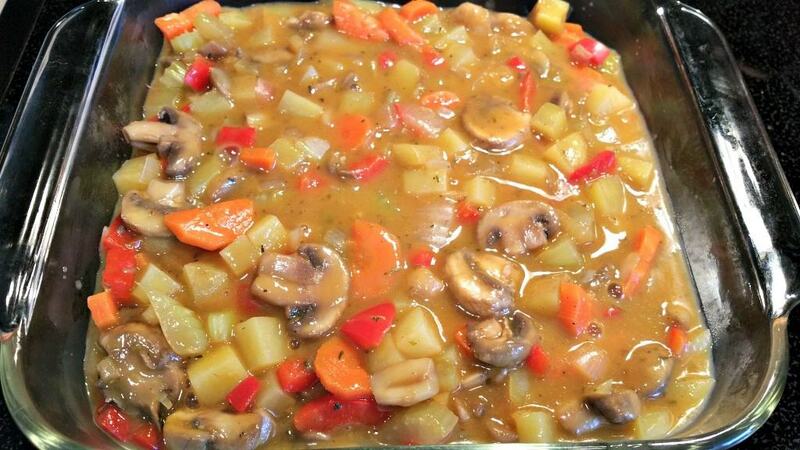 It thickened up nicely and with the spices – it flavored up perfectly. These Flaky Vegan Buttermilk Biscuits worked like a charm, so you’re going to need a batch of biscuit batter too. I cut out individual biscuits and laid them on top to cook. I WANTED to roll out a pie shell and drape it over the top, but this is biscuit dough, not pie shell dough, so biscuits it is. You can use individual little pot pie tins (if you have that many), or like me you can just use a 8″ x 8″ glass baking dish and bake it casserole style. This made enough to also fill a 7″ x 11″ casserole dish with 3 lone biscuits to top it. 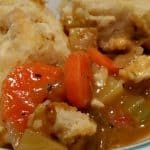 Lots of veggies, a rich, thick gravy, and flaky biscuits on top with NONE of the saturated fat or cholesterol and very minimal sodium. 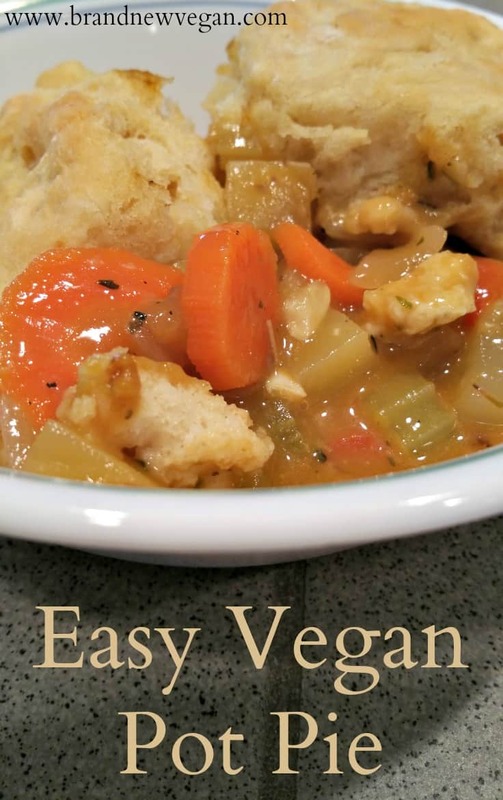 A Vegan Pot Pie full of vegetables, a rich, creamy gravy and topped with flaky vegan buttermilk biscuits. Marie Callender - I hope you're taking notes! 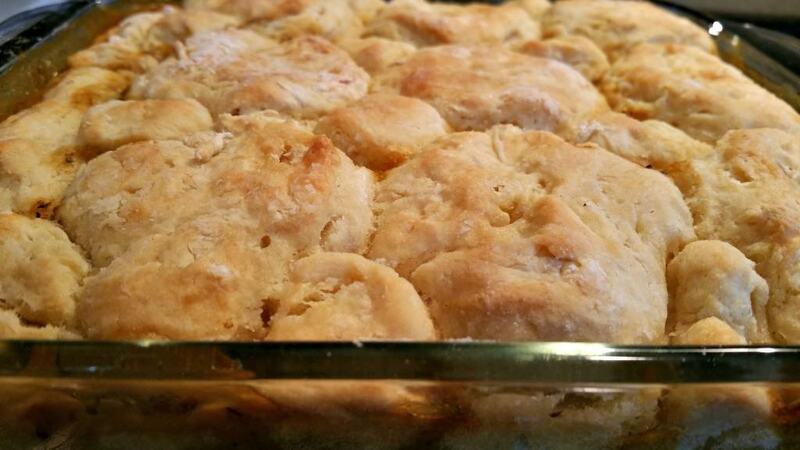 Bake for 18 - 20 min or until biscuits are browned and filling is bubbly. that looks so good. I was wondering if you were going to share your recipe after seeing this yesterday. I love everything you have shared. Thank you again for another great recipe. Isn’t a half cup of flour too much? Mine came out too thick and pastey and I followed directions to a tee? I used white because it didn’t say otherwise. We felt the spices where too strong. I ended up throwing it out:( oh well, everyone’s tastes are different! I took a gamble and made this for Christmas dinner. I omitted the mushrooms(we didn’t have any) and doubled the potatoes (we love potatoes) and added a pie crust on top instead of the biscuits. Anyway…..it was delicious!!!! Everyone loved it and ate seconds!!!! Thanks for the wonderful recipe! Made this last night and was impressed! The filling was really delicious. I made sure to cook the filling in the sauce pot once I added ALL the ingredients for about 15 minute so because I like to make sure my potatoes get soft enough. I did use the biscuit recipe from Minimalist baker because it was a little less involved but overall very delicious. Will be eating it leftover for lunch! Absolutely phenomenal. A definite repeat for me and my meat-eating husband! Just made this for our dinner. Part of our meal plan this week. Turned out really good. the filling was delicious. Used our homemade veggie broth in it. I put the filling in a pie crust which was a really really good decision. I put a pastry puff on top and wish i would have just made the biscuit recipe that was recommended for the top. Next Time! !